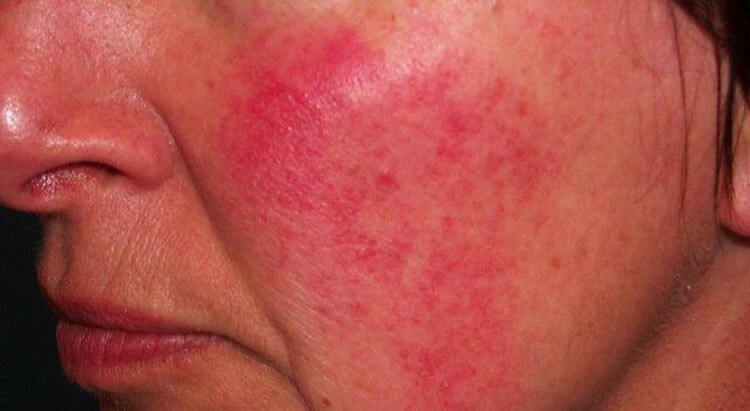 Rosacea is a chronic rash involving the central face that most often affects women aged 30 to 60. It is more common in those with fair skin, blue eyes and Anglo-Celtic origin. Some features of rosacea are red spots and facial redness, scaling and swelling. Flushing and blushing are common, especially after eating spicy food or drinking alcohol. People tend to have more sensitive skin, commonly complaining of stinging or burning after applying sunscreen, make-up or other facial creams. How can rosacea be prevented? It is difficult to prevent rosacea as people can be genetically prone to it but there are some measures that can help. Reduced sun exposure, keeping cool and using a light, oil-free sunscreen can help, along with avoiding anything that causes flushing such as spicy foods and alcohol. Any facial creams should be water-based and not oil-based and steroid creams should never be used on the face if you have rosacea; they may improve the appearance in the short term but increased, rebound redness will occur once the steroid cream is stopped. As there can be many causes for rosacea, often the treatment needs to be multi-faceted. Traditionally oral and topical antibiotics have been used as it was thought that rosacea may have been caused by chronic infection and inflammation. These are often prescribed for up to 3-6 months at a time but they are not curative and repeat courses will be needed from time to time. 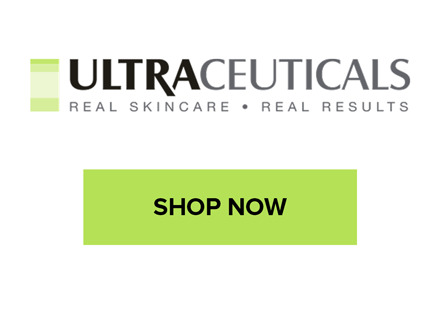 Using a good cosmeceutical skincare brand such as Ultraceuticals can help along with light-based energy treatments such as IPL and LED treatments to target and reduce the visibility of blood vessels. What causes visible blood vessels? There are many causes of visible blood vessels on the face; they can be due to chronic sun exposure especially in smokers, in people with rosacea and due to certain medical conditions, such as lupus and cushing syndrome. They may also be caused by inherited conditions or by any injury to the skin. It is important to have visible blood vessels checked by a doctor as rarely, they can be a sign of skin cancer or other cancers. How can visible blood vessels be prevented? Reduced sun exposure can help prevent the formation of new blood vessels by using sunscreen (SPF50+), covering up with sun-protective clothing, wearing broad-brimmed hats and staying out of the strong sun. Lifestyle factors can help such as regular exercise, avoiding or quitting smoking and a healthy diet containing fruit and vegetables that are rich in antioxidants. Reducing or stopping alcohol consumption can also help. How can visible blood vessels be treated? It is very important to have a full skin check done prior to any treatment to distinguish benign blood vessels (telangiectasia) from their more serious, cancerous counterparts such as basal cell carcinoma. A doctor trained in skin cancer detection will be able to do this and if there is any doubt about the diagnosis, a biopsy should be taken to exclude cancer. 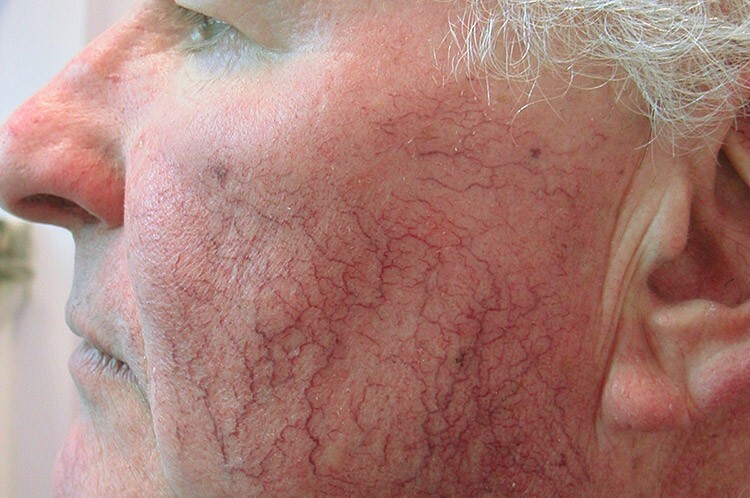 Treatment with IPL can have excellent results by using light-based energy to permanently close the blood vessels and improve the skin’s appearance.